The past is something you never really escape. It embeds itself in you, shapes you, moulds you and lodges itself irretrievably and irrevocably in your memories, with forgetting, true forgetting, never really on the cards. That’s not always a bad thing since our past are usually a mix of good and bad, but in the immediate wake of traumatic events like World War Two, which is where The Guernsey Literary and Potato Peel Society is set, it’s a complicated witches brew of innumerable things that no one wants to particularly recall, much less, relive. And yet when successful writer Juliet Ashton (Lily James) comes to the island, in search of a place to belong (though she doesn’t know that yet) as much as a story for a promised The Times article, and meets the members of the longest-named literary society in the world, the past can’t help but make its presence felt, with far-reaching consequences for everyone concerned. Based on the international bestseller of the same name by Mary Ann Shaffer and Annie Barrows, Guernsey, as it shall henceforth be known in the interest of keeping this review below 2000 words, is a film about the past meeting the present not too long after the former was the latter. 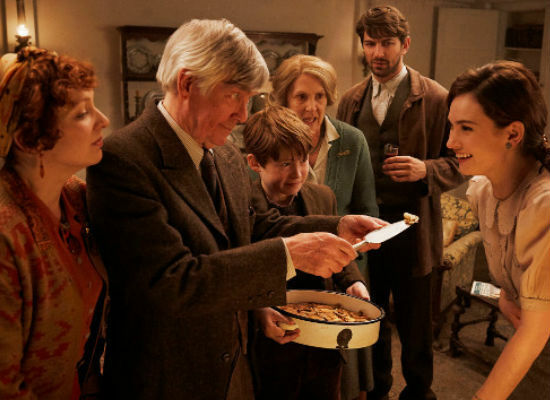 Everyone that Juliet meets on the island from the man she initially corresponds with by letter after he gets her name out of a second-hand book she once owned, pig farmer and book lover Dawsey Adams (Michiel Huisman) to post master Eben Ramsey (Tom Courtenay), gin maker and psychic Isola Pribby (Katherine Parkinson), and fiercely private matriarch Amelia Maugery (Penelope Wilton), is stricken to greater or lesser degrees by their experiences under German occupation during the war. Unlike the rest of their English compatriots who escaped the Nazi tyranny that enveloped the greater part of the European continent – although thanks to endless bombing raids across English cities not the resulting death and destruction, with Juliet losing her parents to blitzkrieg fire from the sky – the people of the Channel Islands, which includes Guernsey, felt the full force of the murderous curtailing of their rights and freedoms, separating them in some degree from the wartime experiences of their countrymen. Unaware of how the war has affected Dawsey, Amelia and the others, and thinking she is simply pursuing a story about an unusually-named literary society, Juliet heads to the island for what she promises her best friend and publisher Sidney Stark (Matthew Goode) and fiancé American diplomat Mark Reynolds (Glen Powell), who you know from the very beginning is a romantic placeholder for the handsome, literate Dawsey, will be a weekend away from promoting her new book. 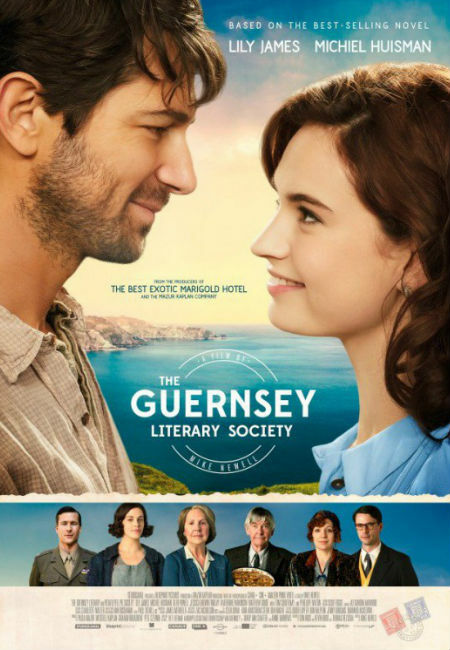 It is, of course, a far longer stint than that, and as Juliet begins to understand that the creation of the Guernsey Literary and Potato Peel Pie Society, borne one night during the occupation as a way of escaping arrest by the Nazis, is the least interesting part of what defines its members, her short stay grows longer and longer, only ending when Mark arrives in search of his fiancée and coerces her to return to London. Naturally enough she doesn’t want to go and while she eventually returns under great duress, you don’t need to be a narrative Einstein to work out that she won’t be back for long in a place that’s no longer home for with someone she wasn’t never meant to spend the rest of her life with. In that, and many other respects, Guernsey is not an experiment film by some out-of-the-box inclined Danish collective. It is, purely and simply, a nice warm blanket with a soothing cup of cocoa, type of story that doesn’t push any envelopes and isn’t interested in redefining cinema as we know it. And you know what? That’s an entirely okay thing because what Guernsey does is own its derivative set-up and execution, lock, stock and hand-hewed barrel, using to dazzling heartwarming effect to help us believe that the past can be bettered by the present if only everyone is open to moving on from where they were. As Juliet digs deeper and deeper into what happened to the missing member of the Society, Elizabeth McKenna (Jessica Brown Findlay), whose daughter Kit (Florence Keen) is being looked after by Dawsey who loves her like his own daughter, and everyone begins to open up about what happened to them during the war – far too easily you’ll think more than once but that’s okay, searing, drawn-out drama this is not – not only does Juliet get the story she’s after (though it quickly ceases to be about that as she becomes emotionally involved with the islanders) but she gets the man )Dawsey), the close friend (Isola) and the life she’s always wanted. More importantly, for the islanders, at least, they get some form of closure as Juliet’s sleuthing, aided by Mark and his extensive diplomatic contacts, gives them the answers they’ve been seeking about Elizabeth, who risked her life more than once for others before she was arrested and sent off the island. Granted the past, which is present in almost sepia-toned comicality at times with the real brutality of Nazi occupation not really seriously presented (again not that kind of movie and that’s all right), seems to be all-too-easily disentangled and sorted through, but there’s enough raw emotion and painful memory, especially for Amelia for whom Elizabeth was a second daughter, to make an emotional impact. You comes to understand, in some small way at least, what it was like, for the residents of Guernsey to have to grapple with the loss of rights and freedoms, with the endless spectre of starvation and imprisonment, and the loss of everything that had come to define their distinctive lifestyle. You also appreciate too, thanks to James’ ability to invest her character with as much pensive solemnity as joyous openness, that Juliet has a great deal more going on beneath the surface, and why the coming together of traumatised but close islanders with an existentially-unmoored writer, comes to mean so much. Guernsey is a joy in just about every respect, offering up hope, healing from the past, a restored present and the sense that for all the evil awfulness that life can throw at you, that there is also great joy and reward waiting too. The film is unapologetically cosy and warmhearted, with plenty of gorgeous shots of the island courtesy of cinematographer Zac Nicholson’s to whet the visual appetite, but its feel good emotionality comes with more substance that other films of its ilk, with the inevitable coming together of Dawsey and Juliet – not even remotely a spoiler if you’re paying even the slightest bit of attention to the trailer – the healing that precedes it, allowing you to leave the cinema reassured that no matter how searingly nightmarish the past can be, the present, and by definition, the future, can be redeemed more fulsomely and profoundly than anyone has a right to expect. The cynics will no doubt carp that there isn’t how life plays out, that it’s all too neat, sweet and perfect, but whether it’s 1946 Guernsey or 2018 Sydney Australia, being able to believe, even for the two hours that Guernsey has you in its soft embrace, that a dark past can beget a lighter present, isn’t such a bad thing, and might just be what our current blighted age, all scoffing and scornfulness aside, needs to hold onto a little more firmly, now more than ever.